Redecos and all their awesomeness…. It’s storming pretty bad up at the cabin today, so all I can really do is dink around on the internet, play around with Shockwave, and post on him soon!! And let me tell you – I’m 100% in. You see, the biggest draw for me on Hot Spot is that he’s always had a black head and red eyes. 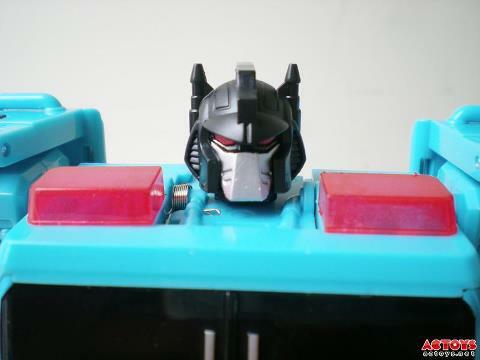 Very Decpticon-y for a humble, not always sure of himself commander. There’s something about it that just makes me really like him. So yeah…I’ll be picking him up for sure. But it got me thinking of some of the aspects of the Transformer community, there are things I don’t like, such as unnecessary exclusives (yes, Hot Spot, I’m looking at you) and the exceptionally whinny and overly critical collectors. But there are things I really like, and oddly enough, I LOVE redecos. I know some people see it as a ploy on Has/Tak’s part, but there’s something about taking a mold, painting it totally different and popping on a new head sculpt to make a new character that really gets me. So now I have to keep an eye on the market and see when Hot Spot here get’s a pre-order started. He will be mine.